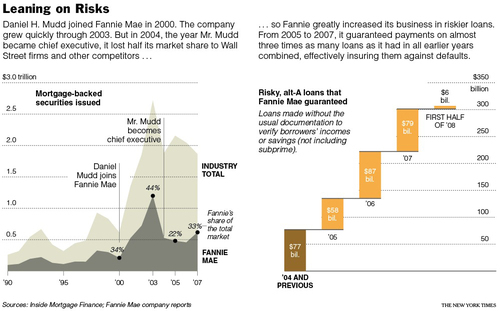 The Sunday New York Times has a very interesting article on Fannie Mae and the current financial crisis. They do a decent job at delving into the complexities of the GSEs, and the many factors that went into the decision making at the senior level of the company. This includes pressure from clients such as Coutrywide CEO Angelo Mozilo, pressure from Congress, and the demands from investors for the company to be more aggressive. Most of all, it looks at the ongoing competitive demands of the market place that Fanny was in. The key to understanding the GSE story is grasping their role within the bigger picture of the economy and housing sector. While there are some pundits who prefer talking points over reality (Charlies Gasparino, Lawrence Kudlow, James Pethoukoukis, and Jeff Saut all toed the GOP line) I prefer to keep all of my analyses based on the data and facts. Rather than creating historical revisions for partisan reasons, I prefer to keep it reality based. (I'm an independant, and that's how I roll). The current housing and credit crises has many, many underlying sources. 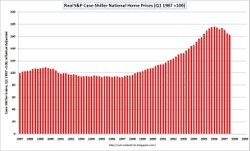 Its my opinion there were two primary causes leading to the boom and bust in Housing: A nonfeasant Fed, that ignored lending standards, and ultra-low rates. This nonfeasance under Greenspan allowed banks, thrifts, and mortgage originators to engage in all manner of lending standard abrogations. We have detailed many times the I/O, 2/28, Piggy back, and Ninja type loans here. These never should have been permitted to proliferate the way they did. The most significant element were the 2/28 APRs, and their put back provision. Just about all of these gave the securitizer/repackager the right to return the loans within 6 (or 12) months if they went into default. Hence, our proposition that the 2002-07 period was unique in the history of finance. If any of these mortgages went bad within 6 months, the undewriter was on the hook. HOW DIFFERENT WERE LENDING STANDARDS IF YOU ONLY NEED TO ENSURE THE BORROWER WOULDN'T DEFAULT FOR 6 MONTHS VERSUS FINDING BORROWERS WHO WOULDN'T DEFAULT FOR 30 YEARS. In a rising price environment, 99% of the mortgages were not returned by the securitizers to the originator. From 2001 to 2005, the mortgage firms thrived. However, once prices peaked and reversed, things changed. From 2006-08, Wal Street began putting back mortgages to originators in greater numbers. This led to nearly 300 mortgage firms imploding. We can blame the lenders, the securitizers, the borrowers, and Fannie/Freddie, but it doesn't matter much. By the time Fannie and Freddie began changing their mortgage buying rules, the Housing boom was already in full gear, and the crash was all but inevitable. "As Freddie Mac Chairman and CEO Richard Syron recently put it, the GSEs have been hit by a "100-year storm" in the housing market, accentuated by some higher-risk mortgages that they were forced to buy to meet government affordable-housing targets. The latter contention is more than disingenuous. A substantial portion of Fannie's and Freddie's credit losses comes from $337 billion and $237 billion, respectively, of Alt-A mortgages that the agencies imprudently bought or guaranteed in recent years to boost their market share. These are mortgages for which little or no attempt was made to verify the borrowers' income or net worth. The principal balances were much higher than those of mortgages typically made to low-income borrowers. In short, Alt-A mortgages were a hallmark of real-estate speculation in the ex-urbs of Las Vegas or Los Angeles, not predatory lending to low-income folks in the inner cities." Only pure partisans take as gospel the statements of an embattled CEO whose own words are belied by the firm's balance sheet and P&L statements. What about the ultra low rates? Consider that the Greenspan Fed maintained a 1.75% Fed fund for 33 months (December 2001 to September 2004), a 1.25% for 21 months (November 2002 to August 2004), and lastly, a 1% Fed funds rate for 12+ months, (June 2003 to June 2004). That was fuel for the fire, and fed the boom even more, sending prices skyward. And not just here . . . As the central bank for the largest economy in the world, the Fed's rate action had repercussions in Housing markets everywhere. Rate cuts here richocheted around the world, sending home prices upwards globally. As to the credit crisis, it too, has many many proximate causes, but the two I focus upon as having the greatest impact was exempting CDOs from any sort of regulatory scrutiny (Commodities Futures Modernization Act of 2000) and the payola scandal of the rating agencies Moody's, Fitch, S&P slapping Triple AAA ratings on all manner of junk paper. A few other factors impacted housing: In 1997, the Taxpayer Relief Act that dropped capital gains to 20% from 28%, and also exempted the first $500,000 for married couples selling house (allowable once every two years). Around that time,the stock market boom and tech dot com bubble was in full throat. That put ALOT of money in people's hands in 1997, 98, 99 and Q1 of 2000. In the late 1990s, I had many discussions with clients, real estate agents and traders about the equities into house rotation: Take some equity profits off the table and then trade up in real estate. Consider these S&P500 gains in the markets: 1995=34%, '96=20%, '97=31%, '98=27%, and from Oct '99 to March 2000, the Nasdaq was up 100%. The folks who want to place the entire crisis at FNM/FRE 's doorstep miss the point -- and let me hasten to add that I was never a fan of the company, and we were short FNM from over a year ago, at $42+ -- these people seem to miss all of the big picture issues, and are focsing on minor factor and outright irrelevancies. This was not a "social engineering" experiment, as the radical right has called it. This was extreme short sightedness. Fannie Mae was not a government entity, they were an independent, publicly traded, private sector firm. They were allowed to borrow at better rates than banks as a GSE. They bought what they did in an attempt top grab share and profits. If they came under pressure from Congress -- or Angelo Mozilo, or hedge fund investors -- it was because they were trying to capture market share and profits and maintain an advantageous position in the marketplace. "The chief executive of the mortgage giant Freddie Mac rejected internal warnings that could have protected the company from some of the financial crises now engulfing it, according to more than two dozen current and former high-ranking executives and others. • Between 2005-08, Fannie purchased or guaranteed at least $270 billion in loans to risky borrowers. As I have said repeatedly, Fannie and Freddie were cogs in the great housing machinery, and they bear some responsibility for the current debacle. But to claim they were the most significant factors misses the true tale of our twin Housing and Credit debacles. Fannie has been around since 1938, Freddie since 1968, the CRA has been around since 1977 -- suddenly, all of housing goes to hell in 2005, and then credit collapses 2 years after -- and the best explanation some people can come up with is Fannie, Freddie and CRA? Gee, isn't that rather odd -- especially after 70 years? Then there is the international issue: If Fannie and Freddie and the 1977 CRA (and amendments) are to blame for the US boom and bust, how did the rest of the world end up with a housing boom too? Why did prices and sales go skyward in the UK, France, Spain, Ireland, Australia, etc.? They had no CRA, or a Fannie Mae, or a Freddie Mac, -- so then what caused their housing boom? The short answer: Ultra low rates, securitization, and perhaps some of our homegrown, innovative lending standards. While I understand that reducing the complexities of economic history into bumper sticker phrases is politically expedient, it does not help us understand the root cause of the problems. And, it gets ibn the way of helping us fashion a solution for the future. Hence, why I hold the weasels who are attempting to obscure reality and rewrite history in such disdain. For the non-partisan, non hacks amongst you, for the policy makers and academics and economists who are truly interested in how this came to pass, and what we can do to fix it, the bottom line remains: The CRA was irrelevant to the current crisis, and Fannie Mae and Freddie Mac were mere cogs in a very complex financial machine, with many moving parts. But the primary cause of the mess? Not even close . . .
A thoughtful analysis of a complex issue. It is interesting to see the NYT has woken up from years of slumber. Unfortunately they have become an organ of post hoc analysis, being completely unable to process what is happening in real time. Now they are simply catching up with the blogs. When the history of this period is written, the Times will be found complicit in the astonishing criminality of this regime. I am still dumbfounded at the lack of protest by the Times against the Iraq War and their inability to see the bubbles for what they were: an illusion of prosperity. Is it possible that they are afraid, or are the Sulzbergers simply on the payroll of the evil Neocon empire?